Mother’s Day in children’s church is full of excited children, many who came with Mom or Grandmother and may not attend regularly. I see this special day in May as a grand chance to make a good impression on kids and parents. If you do too, perhaps you could use some extra ideas. In the “big church” they’ll be recognizing young moms and older ones, expecting moms and foster moms. Here’s an opportunity to do something a little different. How can you help kids esteem and appreciate mothers everywhere? Before Mother’s Day, interview some of the Moms in your ministry. Ask questions like, “What’s the best thing about being a Mom?” or “What’s your favorite Mom job?” Set your show to music and roll the video as a surprise to the kids. Make sure each child who visits will have a flower to give to their mother. Have them wrapped in tissue with a ribbon tied to them. 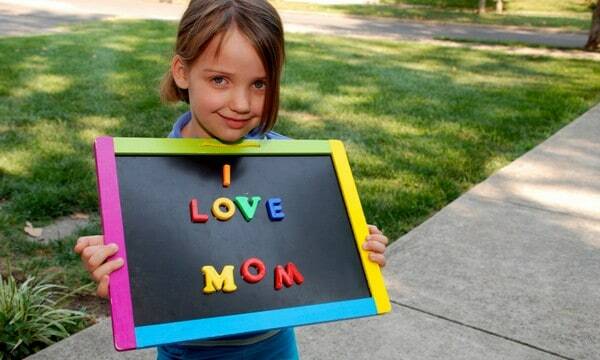 During your crafting session, give kids little gift cards and ask them to write a note to Mom. Hole punch the card and attach it to the ribbon. What is Mom’s favorite TV show? What is your Mom’s secret talent? Have kids fill out the guessing game sheet and take it home. Ask Mom to check the answers. Make signs for the preschoolers to hold like, “Honor your mother and father,” or “Mommy is a blessing!” Kids can bang on drums, shake tambourines and march holding their signs during service. Ask the pastor if your children can parade through at the beginning or end of service. Moms give and give, don’t they? Make a big deal out of praying for Moms. Be sensitive to the needs of individual families, they don’t all “look alike.” Remember the children who have lost their mothers too. Lead the children in a special prayer for Moms. Tony Kummer (Editor) reviewed & updated this page on : May 9, 2014 at 8:12 am. All our content is peer reviewed by our readers, simply leave a comment on any post suggest an update.